These functions are declared in the following header file. Link with allegro_primitives. Shut down the primitives addon. This is done automatically at program exit, but can be called any time the user wishes as well. High level drawing routines encompass the most common usage of this addon: to draw geometric primitives, both smooth (variations on the circle theme) and piecewise linear. Outlined primitives support the concept of thickness with two distinct modes of output: hairline lines and thick lines. Hairline lines are specifically designed to be exactly a pixel wide, and are commonly used for drawing outlined figures that need to be a pixel wide. Hairline thickness is designated as thickness less than or equal to 0. Unfortunately, the exact rasterization rules for drawing these hairline lines vary from one video card to another, and sometimes leave gaps where the lines meet. If that matters to you, then you should use thick lines. In many cases, having a thickness of 1 will produce 1 pixel wide lines that look better than hairline lines. Obviously, hairline lines cannot replicate thicknesses greater than 1. Thick lines grow symmetrically around the generating shape as thickness is increased. While normally you should not be too concerned with which pixels are displayed when the high level primitives are drawn, it is nevertheless possible to control that precisely by carefully picking the coordinates at which you draw those primitives. 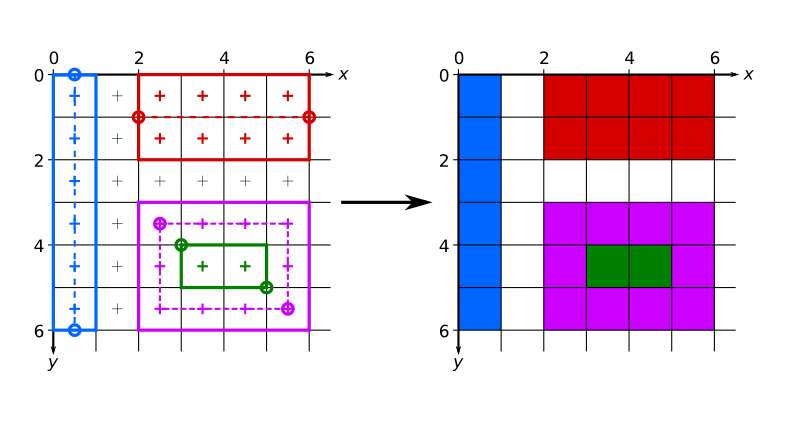 Diagram showing a how pixel output is calculated by the GPU given the mathematical description of several shapes. This figure depicts three shapes drawn at the top left of the screen: an orange and green rectangles and a purple circle. On the left are the mathematical descriptions of pixels on the screen and the shapes to be drawn. On the right is the screen output. Only a single pixel has its center inside the circle, and therefore only a single pixel is drawn on the screen. Similarly, two pixels are drawn for the orange rectangle. Since there are no pixels that have their centers inside the green rectangle, the output image has no green pixels. Diagram showing a practical example of pixel output resulting from the invocation of several primitives addon functions. It can be seen that lines are generated by making a rectangle based on the dashed line between the two endpoints. The thickness causes the rectangle to grow symmetrically about that generating line, as can be seen by comparing the red and blue lines. Note that to get proper pixel coverage, the coordinates passed to the al_draw_line had to be offset by 0.5 in the appropriate dimensions. 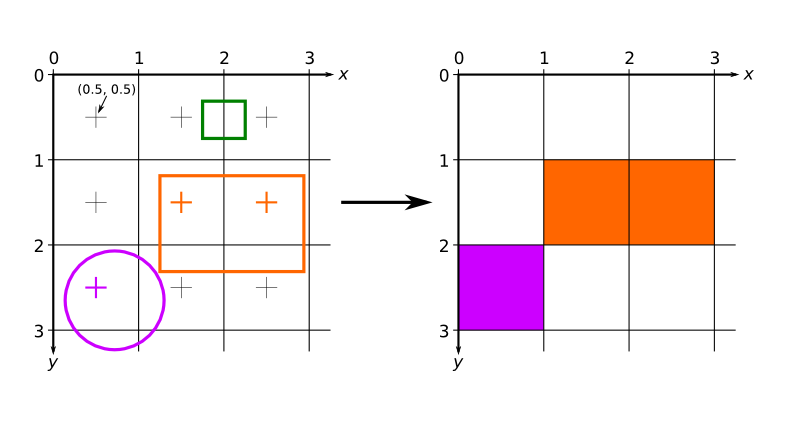 Filled rectangles are generated by making a rectangle between the endpoints passed to the al_draw_filled_rectangle. Outlined rectangles are generated by symmetrically expanding an outline of a rectangle. With a thickness of 1, as depicted in the diagram, this means that an offset of 0.5 is needed for both sets of endpoint coordinates to exactly line up with the pixels of the display raster. The above rules only apply when multisampling is turned off. When multisampling is turned on, the area of a pixel that is covered by a shape is taken into account when choosing what color to draw there. This also means that shapes no longer have to contain the pixel's center to affect its color. For example, the green rectangle in the first diagram may in fact be drawn as two (or one) semi-transparent pixels. The advantages of multisampling is that slanted shapes will look smoother because they will not have jagged edges. A disadvantage of multisampling is that it may make vertical and horizontal edges blurry. While the exact rules for multisampling are unspecified, and may vary from GPU to GPU it is usually safe to assume that as long as a pixel is either completely covered by a shape or completely not covered, then the shape edges will be sharp. The offsets used in the second diagram were chosen so that this is the case: if you use those offsets, your shapes (if they are oriented the same way as they are on the diagram) should look the same whether multisampling is turned on or off. When thickness <= 0 this function computes positions of num_points regularly spaced points on an elliptical arc. When thickness > 0 this function computes two sets of points, obtained as follows: the first set is obtained by taking the points computed in the thickness <= 0 case and shifting them by thickness / 2 outward, in a direction perpendicular to the arc curve. The second set is the same, but shifted thickness / 2 inward relative to the arc. The two sets of points are interleaved in the destination buffer (i.e. the first pair of points will be collinear with the arc center, the first point of the pair will be farther from the center than the second point; the next pair will also be collinear, but at a different angle and so on). The destination buffer dest is interpreted as a set of regularly spaced pairs of floats, each pair holding the coordinates of the corresponding point on the arc. The two floats in the pair are adjacent, and the distance (in bytes) between the addresses of the first float in two successive pairs is stride. For example, if you have a tightly packed array of floats with no spaces between pairs, then stride will be exactly 2 * sizeof(float). Draws a pieslice (outlined circular sector). Draws a filled pieslice (filled circular sector). Calculates a Bézier spline given 4 control points. If thickness <= 0, then num_segments of points are required in the destination, otherwise twice as many are needed. The destination buffer should consist of regularly spaced (by distance of stride bytes) doublets of floats, corresponding to x and y coordinates of the vertices. Draws a Bézier spline given 4 control points. Draws a series of straight lines given an array of points. The ribbon will go through all of the passed points. For maximum portability, you should only use textures that have dimensions that are a power of two, as not every videocard supports them completely. This warning is relaxed, however, if the texture coordinates never exit the boundaries of a single bitmap (i.e. you are not having the texture repeat/tile). As long as that is the case, any texture can be used safely. Sub-bitmaps work as textures, but cannot be tiled. Some platforms also dictate a minimum texture size, which means that textures smaller than that size will not tile properly. The minimum size that will work on all platforms is 32 by 32. A note about pixel coordinates. In OpenGL the texture coordinate (0, 0) refers to the top left corner of the pixel. This confuses some drivers, because due to rounding errors the actual pixel sampled might be the pixel to the top and/or left of the (0, 0) pixel. To make this error less likely it is advisable to offset the texture coordinates you pass to the al_draw_prim by (0.5, 0.5) if you need precise pixel control. E.g. to refer to pixel (5, 10) you'd set the u and v to 5.5 and 10.5 respectively. Draws a subset of the passed vertex buffer. This function uses an index array to specify which vertices to use. elements - An array of ALLEGRO_VERTEX_ELEMENT structures. Draws a triangle using the software rasterizer and user supplied pixel functions. For help in understanding what these functions do, see the implementation of the various shading routines in addons/primitives/tri_soft.c. The triangle is drawn in two segments, from top to bottom. The segments are deliniated by the vertically middle vertex of the triangle. One of each segment may be absent if two vertices are horizontally collinear. init - Called once per call before any drawing is done. The three points passed to it may be altered by clipping. first - Called twice per call, once per triangle segment. It is passed 4 parameters, the first two are the coordinates of the initial pixel drawn in the segment. The second two are the left minor and the left major steps, respectively. They represent the sizes of two steps taken by the rasterizer as it walks on the left side of the triangle. From then on, the each step will either be classified as a minor or a major step, corresponding to the above values. step - Called once per scanline. The last parameter is set to 1 if the step is a minor step, and 0 if it is a major step. draw - Called once per scanline. The function is expected to draw the scanline starting with a point specified by the first two parameters (corresponding to x and y values) going to the right until it reaches the value of the third parameter (the x value of the end point). All coordinates are inclusive. Draws a line using the software rasterizer and user supplied pixel functions. For help in understanding what these functions do, see the implementation of the various shading routines in addons/primitives/line_soft.c. The line is drawn top to bottom. first - Called before drawing the first pixel of the line. It is passed the coordinates of this pixel, as well as the two vertices above. The passed vertices may have been altered by clipping. step - Called once per pixel. The second parameter is set to 1 if the step is a minor step, and 0 if this step is a major step. Minor steps are taken only either in x or y directions. Major steps are taken in both directions diagonally. In all cases, the the absolute value of the change in coordinate is at most 1 in either direction. draw - Called once per pixel. The function is expected to draw the pixel at the coordinates passed to it. Defines the generic vertex type, with a 3D position, color and texture coordinates for a single texture. Note that at this time, the software driver for this addon cannot render 3D primitives. If you want a 2D only primitive, set z to 0. Note that you must initialize all members of this struct when you're using it. One exception to this rule are the u and v variables which can be left uninitialized when you are not using textures. A vertex declaration. This opaque structure is responsible for describing the format and layout of a user defined custom vertex. It is created and destroyed by specialized functions. offset - Offset in bytes from the beginning of the custom vertex structure. C function offsetof is very useful here. Enumerates the types of primitives this addon can draw. Enumerates the types of vertex attributes that a custom vertex may have. ALLEGRO_PRIM_POSITION - Position information, can be stored only in ALLEGRO_PRIM_SHORT_2, ALLEGRO_PRIM_FLOAT_2 and ALLEGRO_PRIM_FLOAT_3. ALLEGRO_PRIM_TEX_COORD - Texture coordinate information, can be stored only in ALLEGRO_PRIM_FLOAT_2 and ALLEGRO_PRIM_SHORT_2. These coordinates are normalized by the width and height of the texture, meaning that the bottom-right corner has texture coordinates of (1, 1). ALLEGRO_PRIM_TEX_COORD_PIXEL - Texture coordinate information, can be stored only in ALLEGRO_PRIM_FLOAT_2 and ALLEGRO_PRIM_SHORT_2. These coordinates are measured in pixels. Enumerates the types of storage an attribute of a custom vertex may be stored in. Defines the size of the transformation vertex cache for the software renderer. If you pass less than this many vertices to the primitive rendering functions you will get a speed boost. This also defines the size of the cache vertex buffer, used for the high-level primitives. This corresponds to the maximum number of line segments that will be used to form them. Controls the quality of the approximation of curved primitives (e.g. circles). Curved primitives are drawn by approximating them with a sequence of line segments. By default, this roughly corresponds to error of less than half of a pixel.